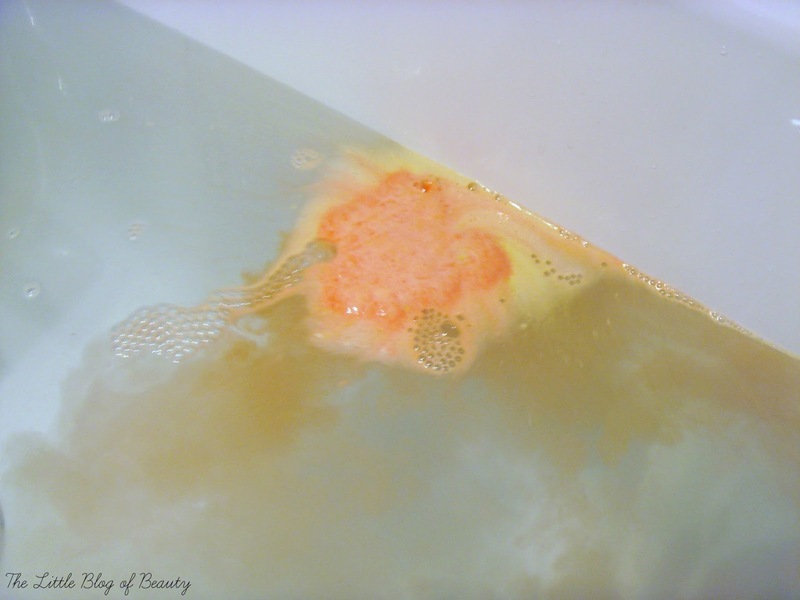 I've now used three out of the five Lush Christmas bath bombs that I picked up (haul post here) and to be honest so far I've been disappointed. Maybe my expectations are too high? I'm not sure, but today I'm talking about Dashing Santa. This one contains Mandarin oil, Bergamot oil and Orange flower absolute and is supposed to smell like Satsumas. Like So white this one took quite a while to dissolve fully, possibly around five minutes, but I didn't really find that it 'dashed' around the bath. It did make its way to the edge when I first dropped it in, but when I pushed it back towards the middle it just hovered. It fizzed away as a bright orange blob releasing some foam and gradually turning the water a bright orange shade. I was hoping I'd be able to smell the Satsuma scent but unfortunately I couldn't detect it at all. 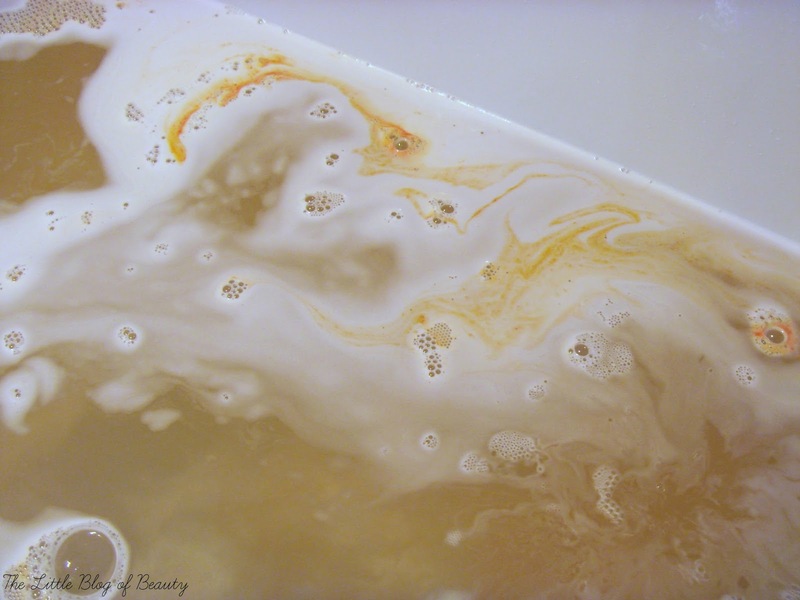 I'd forgotten that this contains snowflake and gold lustre, but when I went to empty the bath I noticed it twinkling away giving a shimmery gold effect to the orange water. Once the bath had emptied I didn't notice any glitter clinging around the bath but some did sit on the bottom and needed rinsing away. As I've already mentioned, along with the others that I've already tried I was disappointed with Dashing Santa. The ones I've tried so far (this one, So white and Father Christmas) seem expensive for one bath when all you're getting is a little bit of foam and coloured water. I guess they also put on a bit of a show as they dissolve, but I'd rather have bubbles and a scent that I can smell. My bath is quite deep and can hold quite a lot of water so I'm wondering if maybe I'm putting these in too much water and it's diluting them down too much. I think maybe bubble bars or bath melts might be more up my street. Have you tried Dashing Santa? 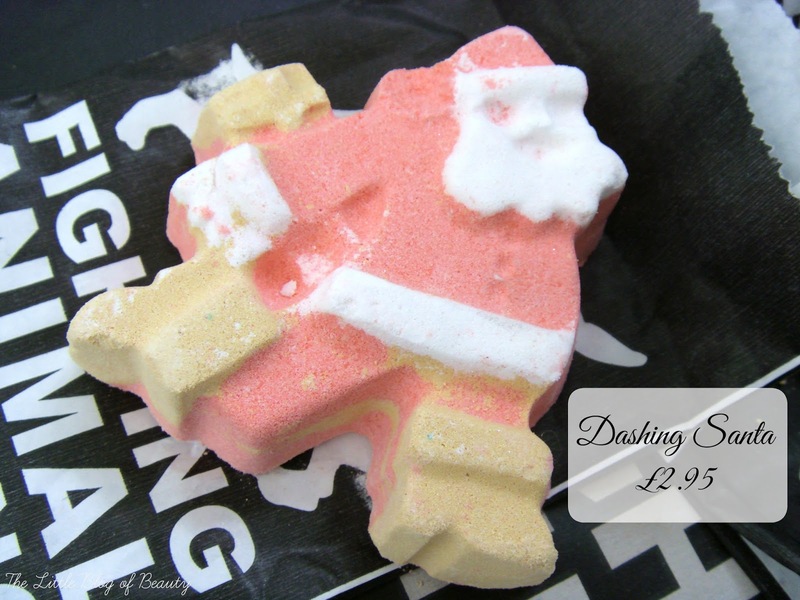 Lush christmas collection is the cutest! Ah such a pity this was a disappointment as it's so cute!